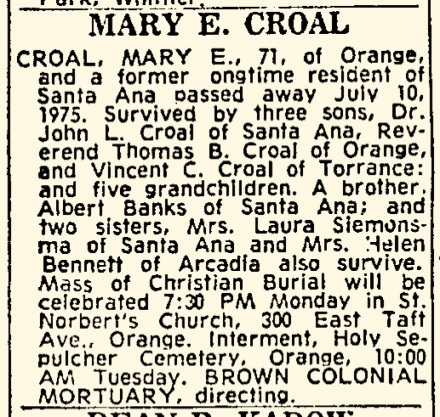 Married Name circa 1925 As of circa 1925,her married name was Croal. Bernice L. Workman was born circa 1897 at Iowa. She married Lewis R. Croal, son of James Matthew Croal and Jennie E. Barrett, circa 1925. Bernice L. Workman died on 23 March 1982 State File #: 04925, Occupation: Housewife. Bernice L. Workman obtained US Social Security Card at Connecticut; Last residence East Hartford, Hartford, Connecticut. She and Lewis R. Croal lived in 1982 at 231 Chester St, East Hartford, Hartford, Connecticut. Married Name 23 July 1929 As of 23 July 1929,her married name was Croal. Mary Evelyn Banks was born on 3 May 1904 at California. 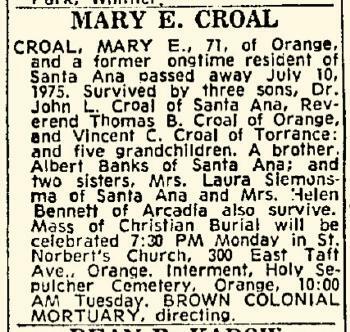 She married Dr. Vincent Cornelius Croal DDS, son of John Patrick Croal and Mary Jane Prunty, on 23 July 1929 at St. Joseph's Church, Santa Ana, Orange, California. Mary Evelyn Banks obtained US Social Security Card; as reported in the California Death Index. Name Variation Dr. John Leroy Croal DDS was also known as Jack. Dr. John Leroy Croal DDS was born on 2 August 1930 at Orange, California, also reported as 04 Aug 1930. He was the son of Dr. Vincent Cornelius Croal DDS and Mary Evelyn Banks. Dr. John Leroy Croal DDS married Dorothy (?) in 1952. Dr. John Leroy Croal DDS died on 1 July 2013 at California at age 82 John Leroy (Jack) Croal obituary. Dr. John Leroy Croal DDS was a Dentist (D.D.S.) in 2011. Name Variation Father Thomas Banks Croal was also known as Tom. Father Thomas Banks Croal was born on 28 May 1932 at Orange, California. 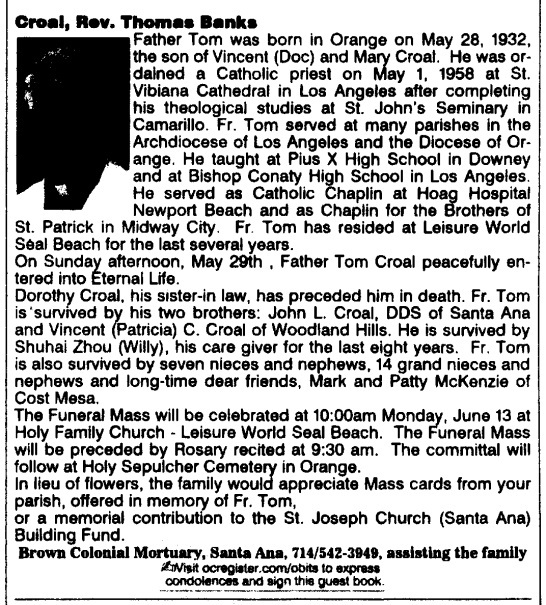 Father Thomas Banks Croal died on 29 May 2011 at California at age 79 Father Tom was born in Orange on May 28, 1932, the son of Vincent (Doc) and Mary Croal. He was ordained a Catholic priest on May 1, 1958 at St. Vibiana Cathedral in Los Angeles after completing his theological studies at St. John's Seminary in Camarillo. Fr. Tom served at many parishes in the Archdiocese of Los Angeles and the Diocese of Orange. He taught at Pius X High School in Downey and at Bishop Conaty High School in Los Angeles. He served as Catholic Chaplin at Hoag Hospital Newport Beach and as Chaplin for the Brothers of St. Patrick in Midway City. Fr. Tom has resided at Leisure World Seal Beach for the last several years. 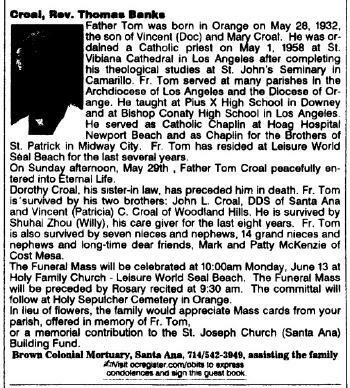 On Sunday afternoon, May 29, 2011, Father Tom Croal peacefully entered into Eternal Life. Dorothy Croal, his sister-in law, has preceded him in death. Fr. 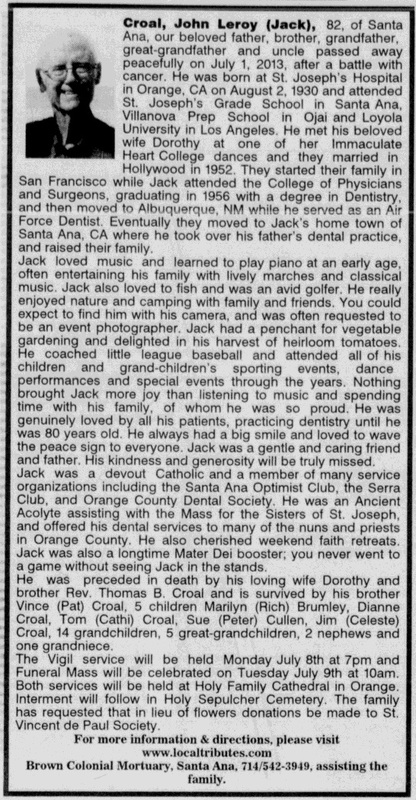 Tom is survived by his two brothers: John L. Croal, DDS of Santa Ana and Vincent (Patricia) C. Croal of Woodland Hills. He is survived by Shuhai Zhou (Willy), his caregiver for the last eight years. Fr. Tom is also survived by seven nieces and nephews, fourteen grand- nieces, and nephews and long-time dear friends, Mark and Patty McKenzie of Cost Mesa. The Funeral Mass will be celebrated at 10:00 a.m. on Monday, June 13, 2011 at Holy Family Church - Leisure World Seal Beach. The Funeral Mass will be preceded by Rosary recited at 9:30 a.m. Committal will follow at Holy Sepulcher Cemetery in Orange. As of 2002, Father Thomas Banks Croal's address was tcroal@aol.com. Name Variation Hans Fedde was also known as John. Name Variation 4 September 1871 As of 4 September 1871, Hans Fedde was also known as John. He was the son of Johann Carl Fedde and Telsche Jurgen Schuman. Hans Fedde was baptized on 3 May 1840 at Rusdorf, Dithmarschen, Schleswig-Holstein, Germany, He was baptized on May 3, 1840. The godparents were: 1. Claus Fedde from Delve (probably a brother to the father); 2. Johann Schumacher from Hennstedt; and 3. Cecelia Marg. Schumann from Rusdorf (the twin sister of the mother). Hans Fedde died on 2 October 1917 at Napa, Napa, California, at age 77 John Fedde, a native of Germany, aged 78 years, succumbed from a heart attack Tues. afternoon at his home on Grant Ave. Mr. Fedde was entering an automobile to take a ride to town when he had the fatal stroke. He was taken into his home and medical attention was promptly rendered. Deceased was a retired farmer and had made his home here for the past ten years. He leaves a widow and five children in Kansas. 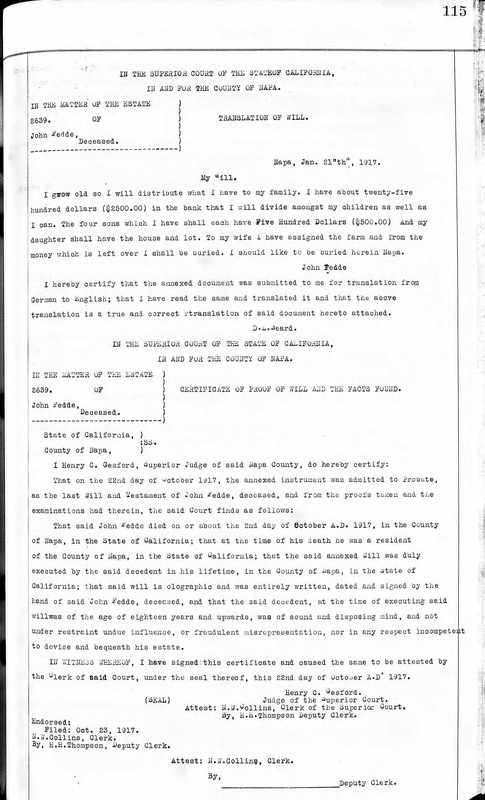 His estate was probated on 22 October 1917 at Napa, California, Probate record and translation of will (from German to English). Hans Fedde was a farmer and laborer. He was confirmed on 24 February 1856 at Heide, Dithmarschen, Schleswig-Holstein, Germany, Hans Fedde, son of Johann Fedde, worker of Wesseln but earlier of Rusdorf, was confirmed in Heide on Oculi Sunday, February 24, 1856.5 He immigrated on 1 April 1865 Hans came to the US by himself on the steam ship Germania. The captain was H. Ehlers. The port into which the ship sailed was New York and it sailed from Hamburg, Germany on 1 April 1865. Entry 39 says: Fedde, Hans from Wesseln, Holstein, who had the occupation of farmhand, 25 years of age, male. [S236] Roger and Leslie Fedde, The Fedde's of Jewell County Kansas, page 171. [S236] Roger and Leslie Fedde, The Fedde's of Jewell County Kansas, page 178. [S236] Roger and Leslie Fedde, The Fedde's of Jewell County Kansas, page 167. [S245] U.S. Federal Census 1900 U.S. Federal Census, by Ancestry.com, ED53. Dwelling 48. [S236] Roger and Leslie Fedde, The Fedde's of Jewell County Kansas, page 172. [S236] Roger and Leslie Fedde, The Fedde's of Jewell County Kansas, pages 180-181. [S236] Roger and Leslie Fedde, The Fedde's of Jewell County Kansas, page 181. Name Variation Joseph Henry Fedde was also known as Joachim Heinrich. Joseph Henry Fedde was born on 26 March 1850 at Schleswig-Holstein, Germany. Joseph Henry Fedde married Anna Margaretha Fedde, daughter of Claus Fedde and Anna Maria Moller, on 21 October 1871 at Lowell, Lake, Indiana. Joseph Henry Fedde witnessed the death of Anna Margaretha Fedde on 9 November 1921 at Welcome, Martin, Minnesota; Anna (Fedde) Fedde drowns in cistern at home. Joseph Henry Fedde died on 5 June 1930 at New Ulm, Brown, Minnesota, at age 80 Also reported as 2 Jun 1930 in Welcome, Marten, Minnesota. 3 December 1864 census of the village Wesseln, church district of Weddingstedt, Wesseln, Dithmarschen, Schleswig-Holstein, Germany Joseph Henry Fedde appeared on the census of 3 December 1864 in the household of Johann Carl Fedde and Telsche Jurgen Schuman at census of the village Wesseln, church district of Weddingstedt, Wesseln, Dithmarschen, Schleswig-Holstein, Germany; From the state archive at the castle of Schleswig, Germany. Entry 44. 7 June 1905 Fairmont Ward 1, Martin, Minnesota He appeared on the census of 7 June 1905 at Fairmont Ward 1, Martin, Minnesota. Joseph Henry Fedde was a farmer. 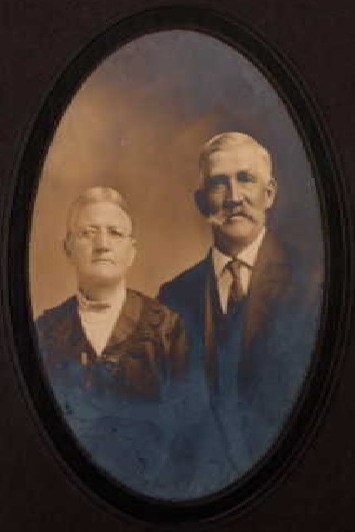 Photo of Joseph Henry and Anna Margaretha (Fedde) Fedde. Hans came to the US by himself. The rest of the family came 11 months later. 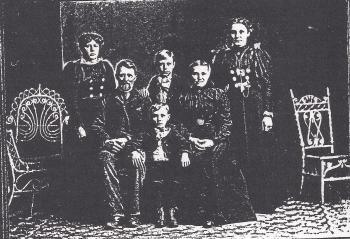 Johann Fedde, his wife and seven children from Germany made passage to the United States aboard the sail ship named Electric. The captain's name was Junge. The ship left Hamburg on March 15, 1866 and sailed to New York.4 On 21 October 1921 50th wedding anniversary celebration. [S236] Roger and Leslie Fedde, The Fedde's of Jewell County Kansas, page 173. Name Variation Wiebke Catherine Fedde was also known as Katie. 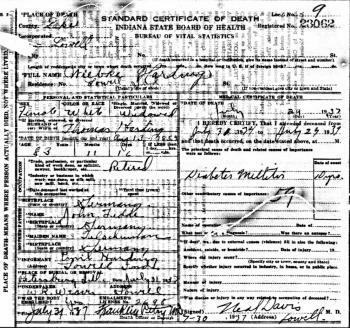 Married Name 19 November 1874 As of 19 November 1874,her married name was Harting. Married Name 19 November 1874 As of 19 November 1874,her married name was Harding. Wiebke Catherine Fedde was born on 13 August 1853 at Holstein, Germany. She was the daughter of Johann Carl Fedde and Telsche Jurgen Schuman. Wiebke Catherine Fedde died on 29 July 1937 at Lake, Indiana, at age 83. 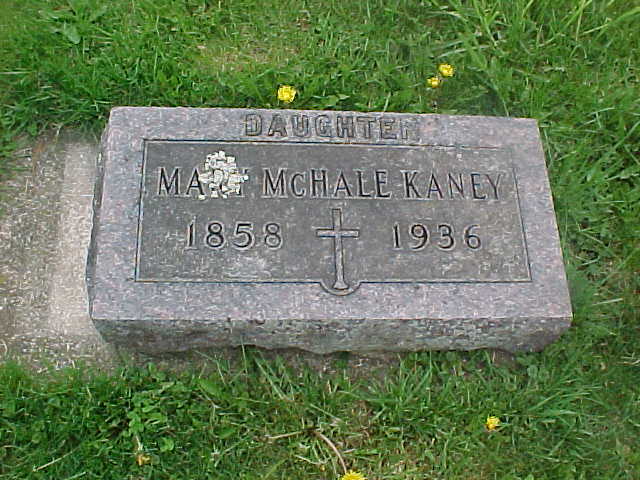 She was buried after 29 July 1937 at Petersburg Cemetery, Grant Park, Kankakee, Illinois. 3 December 1864 census of the village Wesseln, church district of Weddingstedt, Wesseln, Dithmarschen, Schleswig-Holstein, Germany Wiebke Catherine Fedde appeared on the census of 3 December 1864 in the household of Johann Carl Fedde and Telsche Jurgen Schuman at census of the village Wesseln, church district of Weddingstedt, Wesseln, Dithmarschen, Schleswig-Holstein, Germany; From the state archive at the castle of Schleswig, Germany. Entry 44. Hans came to the US by himself. The rest of the family came 11 months later. Johann Fedde, his wife and seven children from Germany made passage to the United States aboard the sail ship named Electric. The captain's name was Junge. The ship left Hamburg on March 15, 1866 and sailed to New York.8 Wiebke Catherine Fedde had 10 children with 3 living in 1900. children. [S186] Illinois, Illinois Statewide Marriage Index, lic. 3701. vol 00B/0114. [S247] U.S. Federal Census 1870 U.S. Federal Census, by Ancestry.com, Pg 14. Dwelling 79. [S246] U.S. Federal Census 1880 U.S. Federal Census, by Ancestry.com, ED15. Dwelling 289. [S245] U.S. Federal Census 1900 U.S. Federal Census, by Ancestry.com, ED55. Sheet 12A. Stamp 381. Dwelling 234. [S244] U.S. Federal Census 1910 U.S. Federal Census, by Ancestry.com, ED122. Stamp 189. [S243] U.S. Federal Census 1920 U.S. Federal Census, by Ancestry.com, Sheet 15A. Stamp 190. ED137. [S250] U.S. Federal Census 1930 U.S. Federal Census, by Ancestry.com, ED45-69. Dwelling 171. Name Variation Thomas Harding was also known as Harting. Thomas Harding was born circa 1855 at Schliewig, Germany. Thomas Harding died before 1900. Married Name 8 November 1828 As of 8 November 1828,her married name was Dieckmann. Wiebke Fedde was baptized One of Wiebke's godparents was Antje Fedde of Delve. She was born on 27 October 1803 at Delve, Schleswig-Holstein, Preussen. She was the daughter of Hans Fedde and Wiebke Ott. Wiebke Fedde was confirmed on 2 February 1818 at Delve, Schleswig-Holstein, Germany. [S236] Roger and Leslie Fedde, The Fedde's of Jewell County Kansas, page 89. Name Variation Meta Stolzenbach was also known as Matie. Married Name January 1928 As of January 1928,her married name was Flickinger. Meta Stolzenbach was born on 11 January 1910 at Beecher, Will, Illinois. She was the daughter of Heinrich Johann Stolzenbach and Lydia Fay Frahm. 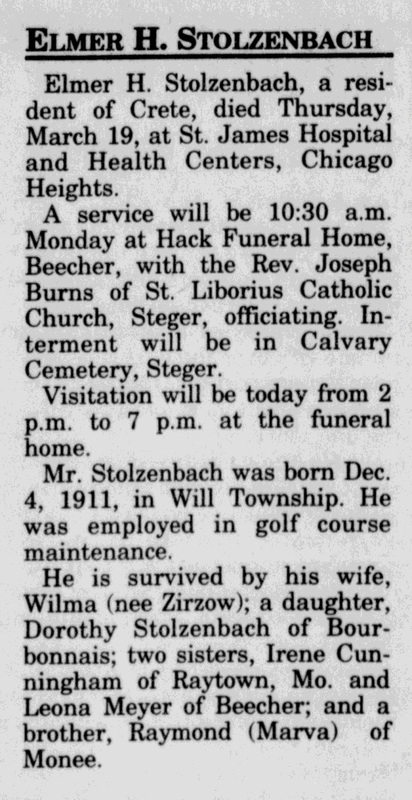 Meta Stolzenbach married William Flickinger in January 1928. 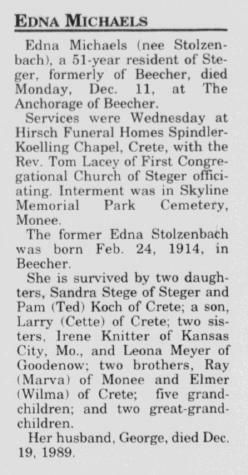 Meta Stolzenbach was buried in April 1976 at Skyline Memorial Park, Monee, Will, Illinois. 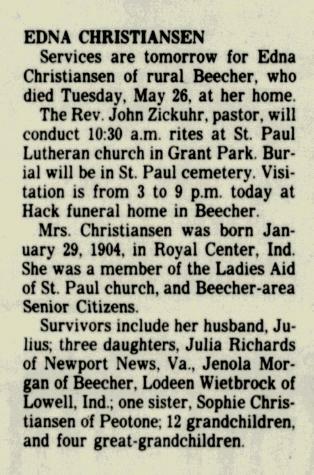 She died in April 1976 at age 66 Meta (Stolzenbach) Flickinger obituary. Meta Stolzenbach lived with Heinrich Johann Stolzenbach in 1918 at Lakeside Dairy Farm, Beecher, Washington, Will, Illinois.2 In June 1952 at Illinois attended Marjorie Flickinger bridal shower. 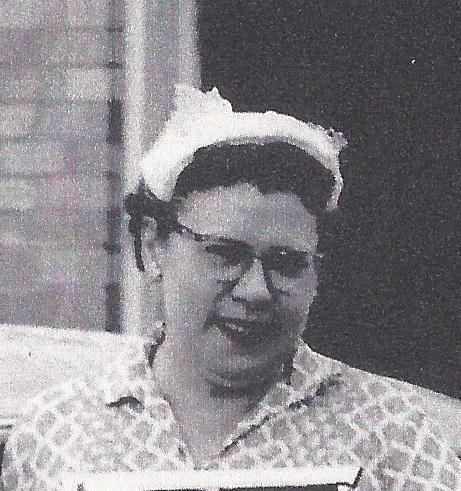 In March 1961 at Cook, Illinois, attended Sandra Joyce Michaels confirmation celebration. 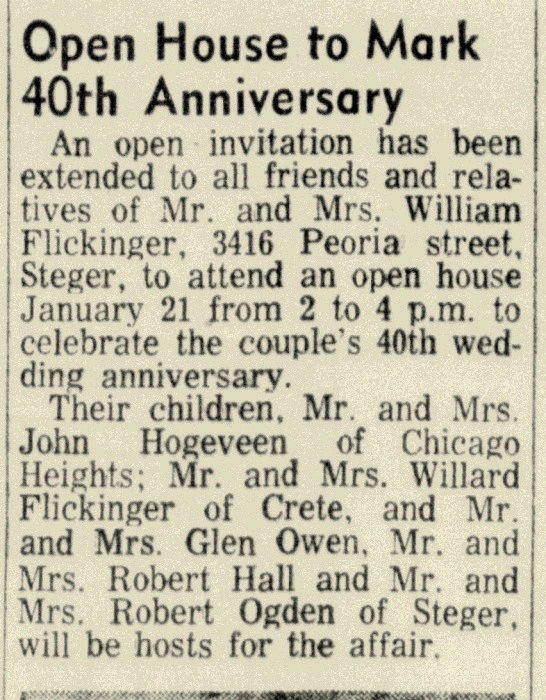 On 21 January 1968 at Steger, Illinois, attended William and Meta (Stolzenbach) Flickinger 40th wedding anniversary celebration. Elmer H. Stolzenbach married Wilma Zirzow. Elmer H. Stolzenbach was born on 4 December 1911 at Will, Illinois. He was the son of Heinrich Johann Stolzenbach and Lydia Fay Frahm. Elmer H. Stolzenbach died on 19 March 1998 at Illinois at age 86 Elmer H Stolzenbach obituary. He was buried after 19 March 1998 at Saint Paul Evangelical Reformed Church Cemetery, Monee, Will, Illinois. Elmer H. Stolzenbach obtained US Social Security Card at Illinois; Last residence Crete, Will, Illinois. He lived with Heinrich Johann Stolzenbach in 1918 at Lakeside Dairy Farm, Beecher, Washington, Will, Illinois.2 In March 1961 at Cook, Illinois, attended Sandra Joyce Michaels confirmation celebration. Married Name Her married name was Michaels. Edna Stolzenbach married George O. Michaels. Edna Stolzenbach was born on 24 February 1914 at Beecher, Will, Illinois. Edna Stolzenbach was buried in December 1995 at Skyline Memorial Park, Monee, Will, Illinois. 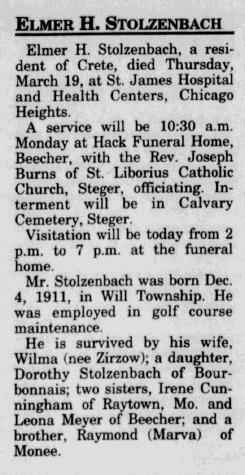 She died in December 1995 at Beecher, Will, Illinois, at age 81 Edna (Stolzenbach) Michaels obituary. 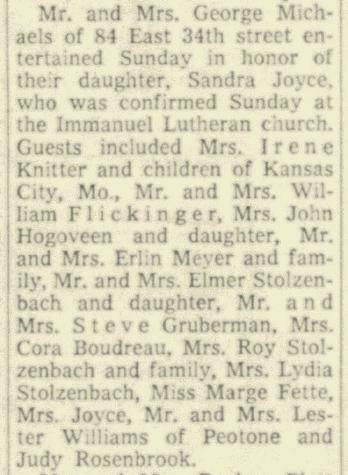 Edna Stolzenbach lived with Heinrich Johann Stolzenbach in 1918 at Lakeside Dairy Farm, Beecher, Washington, Will, Illinois.3 In March 1961 at Cook, Illinois, attended Sandra Joyce Michaels confirmation celebration. Leona Emma Stolzenbach married Erlin Meyer, son of William C. Meyer. Leona Emma Stolzenbach was born on 25 August 1919 at Beecher, Will, Illinois. Leona Emma Stolzenbach died on 14 June 2006 at age 86. She was buried after 14 June 2006 at Skyline Memorial Park, Monee, Will, Illinois. In June 1952 at Illinois attended Marjorie Flickinger bridal shower. In March 1961 at Cook, Illinois, attended Sandra Joyce Michaels confirmation celebration. Married Name 14 February 1899 As of 14 February 1899,her married name was Frahm. Sophia Pfingsten was born on 1 July 1870 at Illinois. She was the daughter of Heinrick Pfingsten and Sophie Schaper. Sophia Pfingsten died on 30 October 1939 at age 69. She was buried after 30 October 1939 at Petersberg Cemetery, Grank Park, Illinois. [S186] Illinois, Illinois Statewide Marriage Index, volume 00C, license 00006789. [S243] U.S. Federal Census 1920 U.S. Federal Census, by Ancestry.com, ED207. Sheet 9B. Dwelling 186. Married Name 16 February 1930 As of 16 February 1930,her married name was Christiansen. Edna Frahm was born on 29 January 1904 at Royal Center, Indiana. She was the daughter of Johann Jacob Bernhard Friedrich Frahm and Sophia Pfingsten. Edna Frahm married Julius Christiansen, son of (?) Christiansen, on 16 February 1930 at St. Paul's Lutheran Church, Grant Park, Illinois. Edna Frahm died on 26 May 1987 at Beecher, Will, Illinois, at age 83 Edna (Frahm) Christiansen obituary. Edna Frahm obtained US Social Security Card at Illinois; last residence Beecher, Will, Illinois. In August 1933 at Plymouth, Iowa, Mrs Julius Christiansen and Sophia Frahm visiting their aunt Mrs H F Klemme; also nieces of Mrs A C Klemme and Henry Frahm. In June 1952 at Joliet, Illinois, attended ceremony where Julia Christiansen received her diploma from Silver Cross school of nursing. 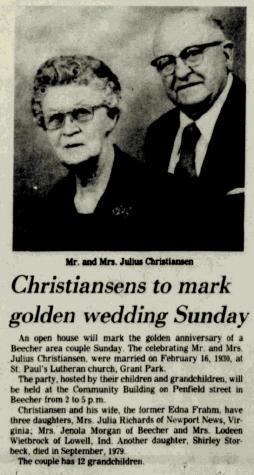 In February 1953 attended Herman and Louisa (Hadders) Heldt Sr 60th wedding anniversary celebration. On 16 February 1955 attended Julius and Edna (Frahm) Christiansen 25th wedding anniversary celebration. Name Variation Sophie M. Frahm was also known as Sophia. Sophie M. Frahm was born on 20 April 1912 at Beecher, Illinois. Sophie M. Frahm married Christ Christiansen, son of (?) Christiansen, on 21 November 1937. Sophie M. Frahm died on 14 August 1998 at age 86 Sophie (Frahm) Christiansen obituary. Sophie M. Frahm obtained US Social Security Card at Illinois; last residence Peotone, Will, Illinois. In August 1933 at Plymouth, Iowa, Mrs Julius Christiansen and Sophia Frahm visiting their aunt Mrs H F Klemme; also nieces of Mrs A C Klemme and Henry Frahm. Name Variation Johannes Hinrich Fedde was also known as John. Johannes Hinrich Fedde was born on 24 February 1844 at Rusdorf, Schleswig-Holstein, Germany, Born February 24, 1844, Johannes Hinrich, to worker Johann Fedde of Rusdorf and his wife Telsche Jurgens (geb.) Schumann, a legitimate son born to this couple. The parents were married in 1939, entry 35. Johannes Hinrich Fedde was baptized on 31 March 1844 at Weddingstedt church, Weddingstedt, Germany, Baptized March 31, 1844, Johannes Hinrich, to worker Johann Fedde of Rusdorf and his wife Telsche Jurgens (geb.) Schumann. Godparents were: 1. Franz Buhmann (or Bahmann); 2. Detlef Hacker of Holm (Suderholm, a village near Heide); 3. Peter Peters. He was buried in 1921 at Saint Pauls Lutheran Cemetery, Kankakee, Illinois, also reported as Petersburg Cemetery, Peotone, Will county, IL. [S244] U.S. Federal Census 1910 U.S. Federal Census, by Ancestry.com, ED198. Stamp 12. Sheet 12A. Dwelling 222. [S243] U.S. Federal Census 1920 U.S. Federal Census, by Ancestry.com, ED116. Dwelling 186. Name Variation Christian Frederick Klemme was also known as Christ. Name Variation Christian Frederick Klemme was also known as Chris. Name Variation Christian Frederick Klemme was also known as Gustav Christoph Christian. Christian Frederick Klemme was born on 19 May 1854 at Crete, Will, Illinois. 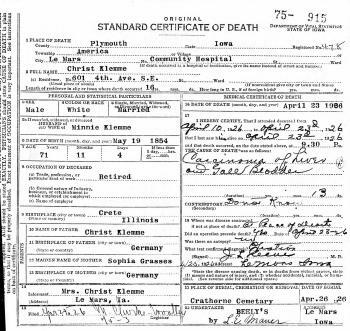 Christian Frederick Klemme died on 23 April 1926 at LeMars, Plymouth, Iowa, at age 71 Christ Klemme obituary. He was buried on 26 April 1926 at Plymouth Presbyterian Church Cemetery (aka Crathorne Cemetery), near Brunsville in Johnson Township, Plymouth, Iowa. 1895 state census, Preston, Plymouth, Iowa Christian Frederick Klemme appeared on the census of 1895 at state census, Preston, Plymouth, Iowa. 1925 State Census, Le Mars, Plymouth, Iowa He appeared on the census of 1925 at State Census, Le Mars, Plymouth, Iowa. 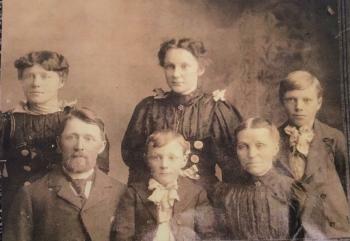 Circa 1900 Christian and Minnie Hecht Klemme family photo. Klemme, and other relatives. On 1 September 1908 at LeMars Sentinel Mr. and Mrs. Chris Klemme and sister, Mrs. Heldt, went to Dakota on Tuesday to visit with Mrs. Gust Jans for a few days. 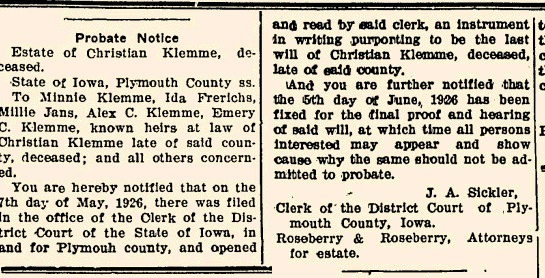 On 6 August 1909 at LeMars Sentinel Gust JANS, from near Spink, S. D., has rented the Chris KLEMME farm for the coming year. Mr. KLEMME and wife will retire from farm life and move to LeMars. 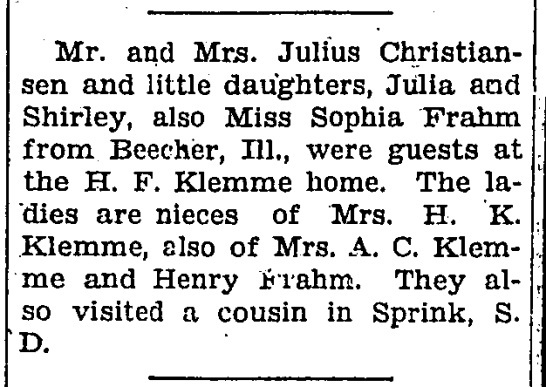 On 3 December 1915 at LeMars Sentinel Christ Klemme, of LeMars, and daughter, Mrs. Gust Jans, of Vernon Center, Minn., visited one day last week at Alex Klemme's. On 23 February 1917 at LeMars Sentinel Emery Klemme and Miss Freda Smidt visited over Sunday at the home of his parents, Mr. and Mrs. Chris Klemme, at LeMars. 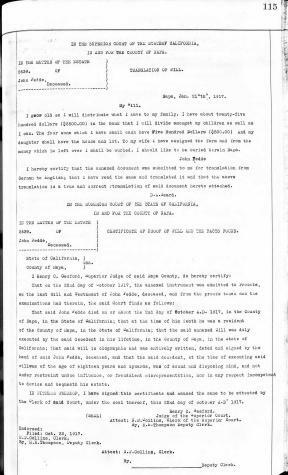 [S193] Church Record, Zion United Lake Co IN Extract, Pg 58. [S245] U.S. Federal Census 1900 U.S. Federal Census, by Ancestry.com, Pg 12 B. ED 105. Dwelling 203. [S243] U.S. Federal Census 1920 U.S. Federal Census, by Ancestry.com, ED121. Sheet 9B. Name Variation Mina W. Hecht was also known as Wilhelmine. Name Variation Mina W. Hecht was also known as Minnie. Name Variation Mina W. Hecht was also known as Mary Minnie. Married Name 8 February 1880 As of 8 February 1880,her married name was Klemme. Mina W. Hecht was born on 8 May 1856 at Hanover, Germany. She was the daughter of Chris Hecht and Katons Brandt. Mina W. Hecht died in March 1932 at age 75 Minnie (Hecht) Klemme obituary. She was buried in March 1932 at Plymouth Presbyterian Church Cemetery (aka Crathorne Cemetery), near Brunsville in Johnson Township, Plymouth, Iowa. 1895 state census, Preston, Plymouth, Iowa Mina W. Hecht appeared on the census of 1895 in the household of Christian Frederick Klemme at state census, Preston, Plymouth, Iowa. 1905 State Census, Plymouth, Iowa Mina W. Hecht appeared on the census of 1905 in the household of Christian Frederick Klemme at State Census, Plymouth, Iowa. 1925 State Census, Le Mars, Plymouth, Iowa Mina W. Hecht appeared on the census of 1925 in the household of Christian Frederick Klemme at State Census, Le Mars, Plymouth, Iowa. Mina W. Hecht immigrated in 1878 According to the 1900 Census in Preston Twp, Plymouth, Iowa for Mina Klemme she immigrated in 1878 and has been in the US for 22 years. Circa 1900 Christian and Minnie Hecht Klemme family photo. nicely. Other members of the family who were sick have recovered. On 1 September 1908 at LeMars Sentinel Mr. and Mrs. Chris Klemme and sister, Mrs. Heldt, went to Dakota on Tuesday to visit with Mrs. Gust Jans for a few days. 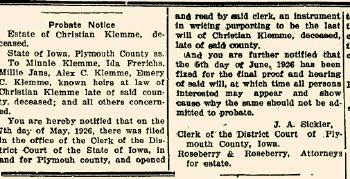 On 6 August 1909 at LeMars Sentinel Gust JANS, from near Spink, S. D., has rented the Chris KLEMME farm for the coming year. Mr. KLEMME and wife will retire from farm life and move to LeMars. 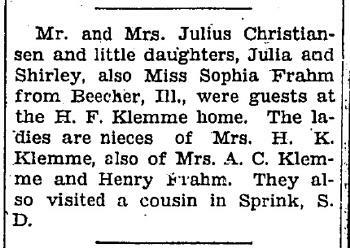 In August 1914 Mrs Christ Klemme visited with daughters Mrs J W Frerichs and Mrs Gust Jans. On 23 February 1917 at LeMars Sentinel Emery Klemme and Miss Freda Smidt visited over Sunday at the home of his parents, Mr. and Mrs. Chris Klemme, at LeMars. In February 1928 Mrs Mina (Hecht) Klemme and son Alex visiting her daughter Mrs Ida Frerichs who is seriously ill.
[S250] U.S. Federal Census 1930 U.S. Federal Census, by Ancestry.com, ED75-16. Dwelling 277. Name Variation Meta Elizabeth Doering was also known as Daering. Name Variation Meta Elizabeth Doering was also known as Mabel. Married Name 1 October 1908 As of 1 October 1908,her married name was Frahm. Meta Elizabeth Doering was born on 15 June 1887 at Grant, Plymouth, Iowa. She was the daughter of Albert Doering and Almte Margaretha Von Hagel. 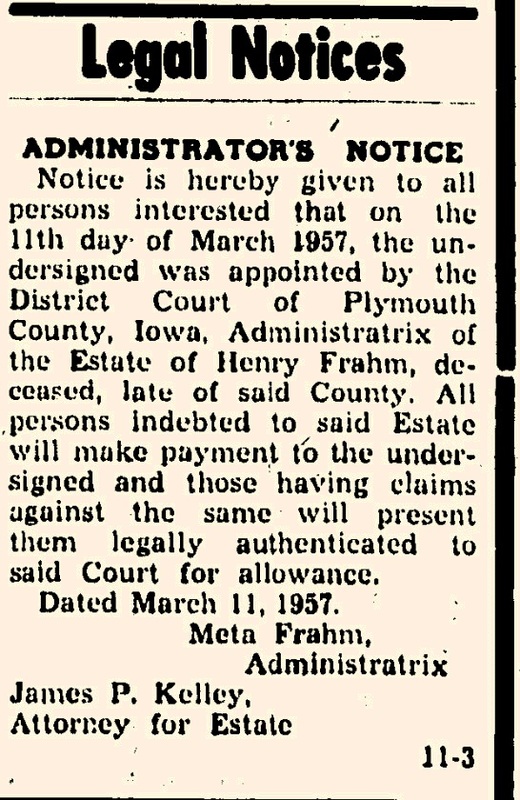 Meta Elizabeth Doering married Heinrich Carl Frahm, son of Jacob Frahm Jr. and Anna Fedde, on 1 October 1908 at LeMars, Plymouth, Iowa. Meta Elizabeth Doering died on 30 March 1967 at LeMars, Iowa, at age 79 Mrs. Meta Elizabeth (Doering) Frahm, 79, died Thursday in a LeMars hospital after a long illness. Funeral services will be at 2 p.m. Monday in St. John American Lutheran Church. The Rev. L. L. Belk will officate. Burial will be LeMars Memorial Cemetery under the direction of the Mauer Funeral Home. Mrs. Frahm, the former Meta Doering, was born June 15, 1887 on a farm near LeMars in Grant township. She was a lifelong resident of Plymouth Co. Survivors include, a son Herbert of Willow Grove, PA; three daughters, Mrs. Fay (Lydia) Hamilton of Spencer, Iowa; Mrs. Martin (Lucille) Larson of rural Remsen, Iowa; Mrs. Donald (Emma) Schmidt of LeMars; eight grandchildren; a sister, Mrs. Tina Onken of LeMars; a brother, John Doering of LeMars and a half-brother (actually sister) Engle Landgraf of Osage, Minn.
1 January 1925 Le Mars, Plymouth, Iowa Meta Elizabeth Doering appeared on the census of 1 January 1925 in the household of Heinrich Carl Frahm at Le Mars, Plymouth, Iowa. 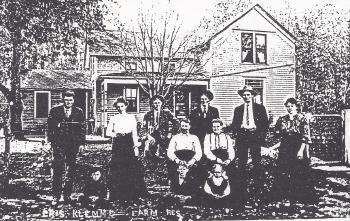 In August 1910 Mr and Mrs H F Klemme visiting Mr and Mrs Henry Frahm and Harry Klemme and wife. In November 1936 at Plymouth, Iowa, Thanksgiving guests at the H F Klemme home. On 22 February 1955 at LeMars, Plymouth, Iowa, attended Fred B and Catherina (Doering) Onken 50th wedding anniversary celebration. 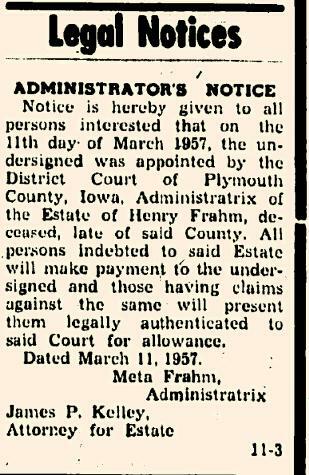 On 11 March 1957 Henry Frahm estate probate notice; Meta Frahm is Executrix. [S245] U.S. Federal Census 1900 U.S. Federal Census, by Ancestry.com, ED105. Dwelling 79. [S244] U.S. Federal Census 1910 U.S. Federal Census, by Ancestry.com, Pg 8931. Sheet 13A. Stamp 119. ED 109. Dwelling 82. [S243] U.S. Federal Census 1920 U.S. Federal Census, by Ancestry.com, ED123. Dwelling 457. [S250] U.S. Federal Census 1930 U.S. Federal Census, by Ancestry.com, ED75-18. Dwelling 296. Married Name Her married name was Braunesreither. 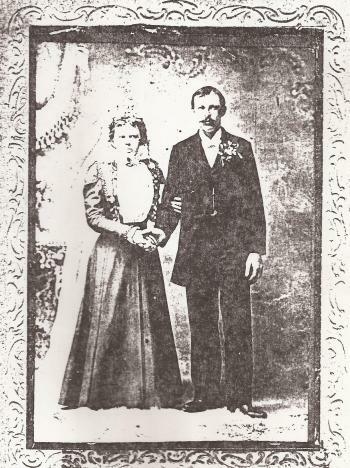 Johanna Lange married John H. Braunesreither. Johanna Lange was born circa 1816 at Bavaria, Germany. [S249] U.S. Federal Census 1850 U.S. Federal Census, by Ancestry.com, Dwelling 172. William A. Mollet was born in April 1883 at South Dakota. He was the son of Gotthardt Mollet and Mary Josephine Braunesreither. William A. Mollet married Bessie Beebe Roush, daughter of Manis Roush and Mary Elizina Sumner, before 1922. William A. Mollet died in 1930 age 32. [S244] U.S. Federal Census 1910 U.S. Federal Census, by Ancestry.com, ED449. Dwelling 21. [S243] U.S. Federal Census 1920 U.S. Federal Census, by Ancestry.com, ED264. Dwelling 43. Name Variation Katherine C. Mollet was also known as Katie. Married Name 13 March 1906 As of 13 March 1906,her married name was Bierle. Katherine C. Mollet was born on 10 September 1881 at South Dakota. Katherine C. Mollet died in November 1974 at age 93. 1905 South Dakota Katherine C. Mollet appeared on the census of 1905 in the household of Gotthardt Mollet at South Dakota. Katherine C. Mollet obtained US Social Security Card at South Dakota; last residence Yankton, Yankton, South Dakota. [S244] U.S. Federal Census 1910 U.S. Federal Census, by Ancestry.com, ED449. Dwelling 26. [S243] U.S. Federal Census 1920 U.S. Federal Census, by Ancestry.com, ED264. Dwelling 31. [S250] U.S. Federal Census 1930 U.S. Federal Census, by Ancestry.com, ED68-27. Dwelling 56. Name Variation Sarah Jane Rister was also known as Reister. Married Name circa 1883 As of circa 1883,her married name was Egan. Sarah Jane Rister was born on 2 January 1863 at Wisconsin also reported as 1862. She was the daughter of Henry Oliver Rister and Anna Kidde. 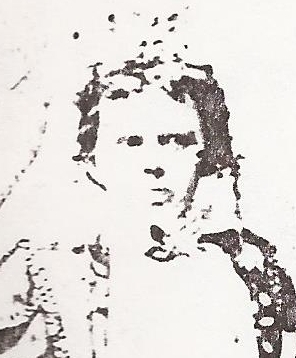 Sarah Jane Rister married Edward Egan circa 1883. Sarah Jane Rister died on 5 March 1935 at age 72. She was buried after 5 March 1935 at Mount Zion Cemetery, Cornelia, Grant, Wisconsin. Sarah Jane Rister had 6 with 3 living in 1900 children. [S245] U.S. Federal Census 1900 U.S. Federal Census, by Ancestry.com, ED171. Dwelling 20. [S243] U.S. Federal Census 1920 U.S. Federal Census, by Ancestry.com, ED. Dwelling . [S250] U.S. Federal Census 1930 U.S. Federal Census, by Ancestry.com, ED52-23. Dwelling 2. Edward Egan was born in March 1866 at Wisconsin. He married Sarah Jane Rister, daughter of Henry Oliver Rister and Anna Kidde, circa 1883. Edward Egan died before 1910. Name Variation Mary Dean was also known as Whelan. Name Variation Mary Dean was also known as Whalen. Married Name 15 April 1873 As of 15 April 1873,her married name was McHale. Married Name 16 June 1909 As of 16 June 1909,her married name was Kaney. Mary Dean was born on 22 October 1856 at Wisconsin tombstone lists birthyear as 1858. She was the daughter of Michael Dean and Bridget (?). Mary Dean married John Paul McHale, son of Patrick McHale and Hannah B. (? ), on 15 April 1873 at Calumet, Wisconsin. Mary Dean and John Paul McHale were divorced before 1889. Mary Dean had 1 with 1 living in 1910 children. [S180] Wisconsin Sauk Co Cemetery Records Vol 6, Pg. 15. 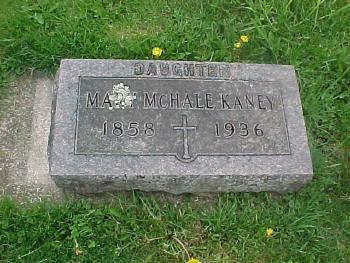 KANEY: Mary 1858 - 1936 (nee McHALE). [S248] U.S. Federal Census 1860 U.S. Federal Census, by Ancestry.com, Page 221. Dwelling 1591. [S246] U.S. Federal Census 1880 U.S. Federal Census, by Ancestry.com, NA Film Number T9-1418 Page Number 74A. Name Variation Henry Hasz was also known as P. Henry. Henry Hasz was born in September 1862 at Wisconsin. He was the son of Johann Nicholaus Hasz and Marie Margaratha Dorathes Luhrsen. Henry Hasz married Magdalena Winter, daughter of August Edward Ludwig Winter and Johanna Christiana Posner, on 16 May 1890. [S247] U.S. Federal Census 1870 U.S. Federal Census, by Ancestry.com, Stamp 293. Page 19. Dwelling 141. [S246] U.S. Federal Census 1880 U.S. Federal Census, by Ancestry.com, ED265. Pg 11-12. Dwelling 96. [S245] U.S. Federal Census 1900 U.S. Federal Census, by Ancestry.com, Dwelling 66. 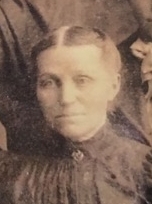 Anna Hasz was born circa 1867 at Wisconsin. She was the daughter of Johann Nicholaus Hasz and Marie Margaratha Dorathes Luhrsen. Anna Hasz died before 1918. Name Variation Mary Hasz was also known as Marie. 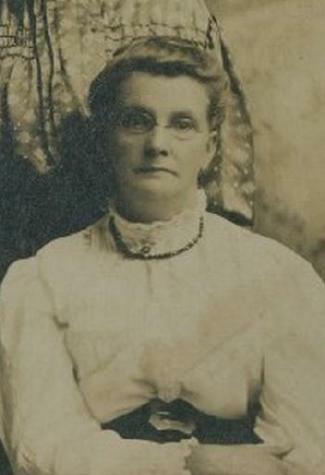 Mary Hasz was born circa 1869 at Wisconsin. Mary Hasz died before 1918. Name Variation Reverand Martin Hasz was also known as Johann Martin. Reverand Martin Hasz was born on 4 June 1871 at Loganville, Sauk, Wisconsin. Reverand Martin Hasz married Emma Maria Elisabeth Geffert, daughter of Johann Heinrich Geffert and Marie Dorothea Henriette Dargel, on 14 September 1898. Reverand Martin Hasz died on 7 June 1925 at age 54. Pastor Martin Hasz, from Town of Grant, Clark County, was installed into his sacred office on June 7, 1925. Pastor Hasz's ministry was a comparatively short one, but one conscientiously and quietly carried forward. It is noteworthy that God uses a quiet personality from time to time to strengthen the stakes and lengthen the cords of His churchly tabernacle. Mr. Albert Mueller, a member of the past, once described very vividly the sudden death of Pastor Hasz. Oh, the grief of Mrs. Hasz and her stricken family! It is well to remember that the families of pastors and teachers who served through 125 years also carried the trials and burdens which afflict any family---and sometimes in a special way afflict those living in the parsonage or teacherage. By grace we are saved! on January 8, Pastor Hasz died of a cerebral hemorrhage. His funeral was conducted on January 14, with Rev. Paul Schedler of Fall Creek officiating in a German service and Rev. Otto Schreiber of Suring conducting an English service. Rev. Braem of Rankin and Rev. Stuth conducted graveside services. Elders of St. Paul and St. John, Luxemburg, were pallbearers. Six clergy were honorary pallbearers. On January 13, it was decided that the following Sunday there would be a collection for memorial for Pastor Hasz. Members were to give as they wished to cover the funeral expense of Rev. Hasz. ....Mrs. Hasz was to receive $25.00 a month until the new pastor came. ....They were to buy furnishings from Mrs. Hasz that would stay at the parsonage. On July 7...It was also resolved that a collection should be taken to cover the remaning funeral expense of the departed Pastor Hasz. Rev. Martin Hasz, pastor of St. John's Evangelical Lutheran Church, in Quincy, Adams County, was born in Loganville, Sauk, WI, June 4, 1871. He is the son of Nicholas and Maria (Luehrsen) Hasz, of Hanover, Germany, who emigrated to the United States about 40 years ago. The family located in Loganville during the early days of Wisconsin's history, and the father engaged in farming, and is still a resident of Loganville. Of a family of eight children, our subject was the fifthe in order of birth, and until about fifteen years of age he attended the parocial school at Loganville. He then went to Milwaukee, and for six years attended the Concordia College of the Evangelical Lutheran synod of Missouri, Ohio and other states, where he finished the Latin and classical course. He then attended Concordia Seminary at St. Louis three years, devoting himself to theology. He was installed as pastor of St. John's church, of Quincy, August 9, 1895, and is also missionary to the Evangelical Lutheran parishes of Oxford, in Marquette county; Lyndon, in Juneau county; Necedah, Juneau county; Cartolville, Adams county; and the church in Springville township, Adams county. The work extends over a large stretch of country, requiring a drive of about one hundred and fifty miles a week. Mr. Hasz holds confirmation classes, and instructs about four days each week. Since accpeting his charge he has met with excellent success, and has organized the churches at Necedah and Springville, and has built the churches in Quincy and Lyndon. Mr. Hasz was married September 14, 1898, to Emma Geffert, daughter of John and Dratha (Dargel) Geffert, of Reedsburg, Sauk-WI. Mrs. Hasz's father was born in Barum, Hanover, Germany, and came to America about 1854 and settle in Reedsburg, and purchased land for farming, part of which lies within the city limits. The mother of Mrs. Hasz was born in Vokel, Hanover, Germany, and came to the United States about 1861, and was married to John Geffert at Reedsburg in 1864. Nine children were born to Mr. and Mrs. Geffert, Mrs. Hasz being their fifth child in order of birth. Rev. Hasz is yet a young man, but his labors have already reaped a bountiful harvest, and he is devoted to the cause for which he consecrated his life, and under his guidance the prosperity of his church is assured, and the world made better by his teachings. He has gained many friends in this circuit, and is popular with his people and honored by them. He is deserving of much praise for what he has accomplished, and is a man of earnest, practical nature, and has infused new life into the church, and it is flourishing under his fostering car. It is a pleasure to meet a man whose heart and soul are in his work, when the chosen labors are fraught with benevolence and kindness, and such a one is the subject of this review. Without a thought for his own comforts he goes the round of his parished, performing his duties with cheerfulness and love, and thinking only of the good resulting to mankind. Funeral services for the late Reverend Martin Hasz, pastor of St. John's Lutheran Congregation in the town of Montpelier and St. John's Lutheran Congregation in the village of Luzemburg, who died January 8 were held january 14 from St. Paul's Lutheran Church in Monpelier. Rev. Paul Schedler of Fall Creek conducted the German services, followed by English services by Rev. Otto Scrreiber of Suring. Rev. R. Stuth of Forestville conducted services at the cemetery in Montpelier. Pastor Hasz contracted infuenza and suffered a paralytic stroke. He had been ill for nine days. Pastor Hasz was born June 4, 1871, at Loganville, Wis. At the age of fifteen he entered Concordia College at Milwaukee, completing his studies for the ministry at Concordia Seminary in St. Louis. He entered the ministry in 1895, locating at Quincy, Adams county, where he did missionary work in that community for eleven years. In the year 1906 he was called to Chippewa Falls. In 1912 he went to Granton, Clark County, where he was pastor for thirteen years. In 1925 Pastor Hasz accepted a call to the congregation in Montpelier and Luemburg. The marriage of Reverend Hasz to Miss Emma Geffert was solemnized at Reedsburg, Sauk-WI, September 14, 1898. Besides his wife, ten children mourn his death. The daily papers report the death of Rev. M. Hasz at Luxemburg, Wisconsin, January 4. Rev. Hasz was formerly pastor of the Zion Lutheran church at Granton and had a host of friends in his parish and for miles around. Wife's parents married: 1864 Reedsburg, WI. Before 1917 Rev. Martin HASZ, pastor of St. John's Evangelical Lutheran church, in Quincy, Adams County, was born at Loganville, Sauk County, WI, 04 Jun 1871. He is the son of Nicholas and Maria (LUEHRSEN) HASZ, of Hanover, Germany, who emigrated to the U. S. about 40 years ago. The family located in Loganville during the early days of Wisconsin's history, and the father engaged in farming, and is still a resident of Loganville. Of a family of eight children our subject was the fifth in order of birth, and until about 15 years of age he attended the parochial school at Loganville. He then went to Milwaukee, and for six years attended the Concordia College of the Evangelical Lutheran synod, of MO, OH and other states, where he finished the Latin and classical course. He then attended Concordia Seminary at St. Louis three years, [p 447] devoting himself to theology. He was installed as pastor of St. John's church, of Quincy, 09 Aug 1895, and is also missionary to the Evangelical Lutheran parishes of Oxford [Marquette County], Lyndon [Juneau County], Necedah [Juneau County], Cartolville [Adams County], and the church in Springville Township [Adams County]. The work extends over a large stretch of country, requiring a drive of about 150 miles a week. Mr. HASZ holds confirmation classes, and instructs about four days each week. Since accepting his charge he has met with excellent success, and has organized the churches at Necedah and Springville, and has built the churches in Quincy and Lyndon. Mr. HASZ was married 14 Sep 1898 to Emma GEFFERT, daughter of John and Dorathea (DARGEL) GEFFERT, of Reedsburg, Sauk County. Mrs. HASZ's father was born at Barum, Hanover, Germany, and came to America about 1854 and settled in Reedsburg, and purchased land for farming, part of which lies within the city limits. The mother of Mrs. HASZ was born in Vokel, Hanover, Germany, and came to the U. S. about 1861, and was married to John GEFFERT at Reedsburg in 1864. Nine children were born to Mr. and Mrs. GEFFERT, Mrs. HASZ being their fifth child in order of birth. Rev. HASZ is yet a young man, but his labors have already reaped a bountiful harvest, and he is devoted to the cause for which he consecrated his life, and under his guidance the prosperity of his church is assured. He has gained many friends in his circuit, and is popular with his people and honored by them. He is deserving of much praise for what he has accomplished, and is a man of earnest, practical nature, and has infused new life into the church, and it is flourishing under his fostering care. His heart and soul are in his work, and he goes the round of his parishes, performing his duties with cheerfulness and love. [S243] U.S. Federal Census 1920 U.S. Federal Census, by Ancestry.com, ED19. Dwelling 5.